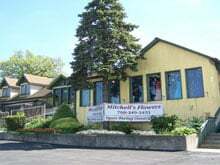 Mitchell's Flowers is a family owned, local business serving the Southwest Suburbs of Chicago. Our two locations, in Orland Park and Hinsdale, allow us to provide the finest floral arrangements and gifts, backed by service that is friendly and prompt. Because all of our customers are important, our professional staff is dedicated to making your experience a pleasant one. That is why we always go the extra mile to make your floral gift perfect. Let Mitchell's Flowers be your first choice for flowers! We are closed most Sundays except for major Holidays. Our commitment to you is 100% satisfaction on all your floral and gift purchases. If you are not completely satisfied, let us know by calling (708) 349-3451. If you have any questions or need more information, please call us directly at (708) 349-3451. We're always here to serve you and make your flower-sending experience a pleasure. We are unable to make home deliveries on Sundays. Deliveries requested on this day will be delivered the following business day. We are able to deliver to most local funeral homes if we have the order by 11:00am on Saturday. Please note the wake times on the special instructions.